How to get Rs. 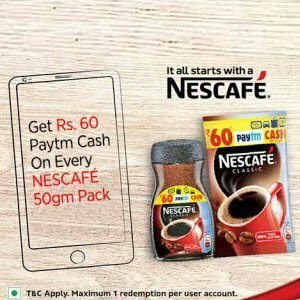 60 PayTm Cash with Paytm Nescafe offer? Only select packs of NESCAFÉ Classic 50g Jar and 50g Sachet with Yellow colour promo band are available this offer. so before make make sure you buying right pack. Checkout example pack below. Price of 50g Nescafe coffee pack or pouch would be Rs. 119 to 130. For the 50 g Jar the code is printed on the back panel. You will need to scratch away the silver coating to get code. For the 50g Sachet the cash code is printed inside of the outer red packaging as shown in the image below. Please tear the pack from the crimp carefully to reveal the code inside. To Redeem code visit Open Paytm NESCAFÉ website. Enter your Nescafe code and click proceed. On successful completion of the process you will receive he following message ”Congratulations! Rs. 60 added to your cash account”. Participation in this Promotion namely, Paytm Nescafe Offer (“Offer”) is purely voluntary and optional. This Offer is not valid in conjunction with any other Offer. Products also available without this Offer. By participating in this Offer, each participant is deemed to have accepted these terms and conditions. This Offer is valid in India from 1st April 2016 to 31 July 2016(‘Offer Period’) on purchase of Nescafe Packs referred to as “Products” and on limited stocks only. On successful application of the Code Rs 60 would be added to user’s Paytm wallet within 24 hours.